Bangkok, Thailand -- The cultural tradition of Thailand has Buddhism at the heart, making it truly unique in my eyes. Everyday, just by speaking Thai, I get reminded of my belief. But like all things beautiful when they become mundane and perfunctory, we stop taking notice and we stop to appreciate. The meanings become dissipated. This is Buddhism today. Buddhism in Thailand has become a tradition that is blindly followed with little comprehension. It’s no longer a way of life. Deep down we know that it’s supposed to be good so we form superstitious beliefs around it, elevating it higher and higher beyond our grasps. Buddha, today, has been reduced down to the golden statues that we pray to for help and merit making. The real Buddha, the historical Buddha has become a distant, remote, god-like figure. Prince Siddhartha’s life is read to children just like any another fairy tale. This is not the way I relate to Buddhism or how I truly appreciate Thai Buddhist culture and tradition. Let me tell you what I mean. As I was growing up I went to monasteries with my family. Monasteries were like a refuge – as well as my playground. I felt at home there. One of my early childhood memories is me lying on my grandmother laps while she chanted and meditated with a group of her friends at the Emerald Buddha temple right here in the heart of Bangkok. To this day I remember this profound sense of peace and togetherness. Everything felt at one and everything was in place. And I don’t mean beautiful or perfect as a piece of high art. Everything was just the way it should be. My grandmother was a devout Buddhist and her commitment to this way of life meant that I had a taste of it too. She implanted it in my mind, a deep devotion to Buddhism that has little to do with rituals and rites. She taught me that Buddhism is not about banking merits for a better next life. Buddhism is about how I live my life now. How my actions have an effect on other living beings. That is why it is important to live life in a way that doesn’t harm others or take advantage of them. That’s not easy! In my teens, I had a passion for reading books about great mediation teachers and in particular Ajahn Mun who was my hero. I did not understand much of the technical bits but he became someone I highly revered. But never in my wildest dream did I think that I could become a forest monk like him. I’m a woman. I did aspire to live his life but only through words and my imagination. My mind was programmed in a way that spiritual life is a privilege of and for men only. Therefore not for me. The women in my childhood like my grandmother supported these monks, attended their meditation classes and organized ways to raise money to support poverty stricken monasteries. There were nuns wearing white robes, but I did not associate them with a spiritual life because they were just like my grandmother, only with shaven heads. To be ordained was something my male cousins did temporarily as a rite of passage and I went to witness and support them. My path of practice was imaginary through books. Then we moved to England. 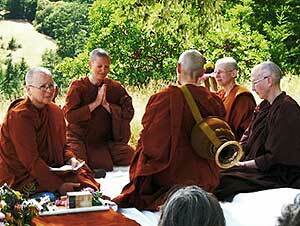 There we became supporters of the Western order of the Forest Monastery Tradition of Venerable Ajahn Chah. His teachings were an eye opener. In English, the Buddhist teaching was decoded and became a manual on how to live life. The Buddha teachings were not kept in beautiful gilded cupboard and bowed to. It was discussed and shared the same way as how to bake a cake. One main exception to Thailand was the way women were encouraged to practice. In England, both men and women who aspire to take up a religious life are given opportunities to do so. I don’t mean just joining chanting and attending meditation retreats. I mean given opportunity to live a religious life. These women with a shaven head wearing the same robes as the monks had a profound effect on my mind. To be taught the path by these women was also a big help. The sense of sisterhood was important. I don’t mean this from a feminist slant. But to be able to live with women practitioners and talk about things openly was new and helpful. It makes the practice even more real and believable. The Siladharas order was the only way for Thai Theravada Buddhist women who wish to live a religious life as alms mendicant to do so. Yet no Thai women have ordained into this sect. I nearly did. I was a novice nun for two years but could not commit to full ordination due to family circumstances. But I would without hesitation if I was free of my obligations. The Siladharas are not monks, nor are they on equal footing with the monks. They are still considered junior to the monks. Most Thais seem to only want to support the monks and often become confused around the Siladharas. Interesting! This does not mean that there are no women practitioners in Thailand. There are many renowned teachers. All are Mae Chee, the eight precepts nuns or lay woman who have to support themselves financially. One is my teacher Mae Chee Pathowan who did not have to worry about getting support. She taught me that all us in these forms, as men or women, are just conventions. When you bow to a male monk or novice monk, you bow to the potential to be enlightened – and not to the man! This lack of respect does not stop any of the women there from practicing? The Buddha teachings are very clear on this. Social order exists only to serve one purpose: to make it easy for a group of people to coexist in harmony. These are just conventions and not to be clung to and identified as the truth. But does this help to promote harmony between the sexes? The answer is no. Not when the culture outside the monastery is teaching the lay people about gender equality. On appearance, this community still follows the Thai patriarchy rules that can be seen as male chauvinism, as men – in this case monks – are allowed to go first, then the women second. The gender inequality has blighted the Western perception of Thai Theravada Buddhism. However, the tide seems to be turning when the branch monastery in Australia has decided to ordain four bhikkhunis and bringing this issue out into the open. Needless to say that Thailand’s council of elders does not accept these women as Theravada bhikkhunis. Is the Western monk ordaining a female nun behaving like a renegade? Is this new? The answer is no, this isn’t new! In 1912 Thai Theravada monks ordained a group of women as bhikkhunis and then again after World War II another two women received bhikkhuni ordination! And in Thailand there is the Venerable Dhammananda, a bhikkhuni who has not been recognized by the order of Theravada elders. I’m now living in Thailand, older and hopefully wiser, or if not wiser then at least with a broader perspective over the world of Buddhism. This question of respecting women as worthy of practice becomes something that is essential for me as a woman Buddhist. So what is to be done? Do we adjust according to the changing times? Or do we just stay the way we’re told to be and hide under the veil of tradition? Or compromise? For me, I feel that there are issues that need to be addressed. But not by force as it reinforces the desire to become something! Is it a simple gender-specific issue of tabloid value? Or even a sexist issue? As simplistic as living in a black and white world? You can say that this issue has no relevance on a spiritual path. But as we do live in a symbiotic open community where the modern world is never that far behind, gender issues in Theravada lineage will not stop being an issue. The question is what we are going to do about it. It made me ask myself why Buddha insisted that the ordained community did not become a closed community. Why did he insist on alms mendicancy? Why did he make the ordained community and lay community totally dependent on each another? However, I do not see this issue as a spiritual one. I do not think that not being able to be ordain as a bhikkhuni is stopping me from living a spiritual life. I feel the issue here is not whether women should be equal to men in this tradition. But why does a women who wants to lead a religious life, why does that woman not get the support and respect she deserves from other women here in Thailand. As long as we think of Buddhism only as a tradition then we will only be clinging to it stubbornly, without reflecting nor thinking about cause and effect, refusing to change because if we change we are losing our tradition and heritage. There will be no room for truly spiritual women. Isn’t it time that we ask ourselves what good is a tradition that divides? We have a beautiful living cultural heritage that does deserve to be put in a museum and glared at in artificial tungsten light. If we’re not careful we will find ourselves in the unique situation where we need to travel to the West to learn about the practice of Theravada Buddhism. Chdarat is a Thai woman living in Bangkok. She writes her own blog QuoteThai. More on Theravada Buddhist nuns at Saranaloka Foundation.